Why would you make Ketchup at home? If you are health conscious, you would. Packaged ketchup contains loads of artificial flavors and preservatives, none of which is good for you. This ketchup can be stored in refrigerator for 4-5 weeks because vinegar and sal act as natural preservatives. You may want to experiment with replaching vinegar with lemon juice which can further extend the life. 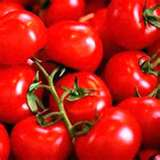 Boil the tomatoes in some water till soft. Let it cool then put it threw a sieve so that the skin and seeds are separated . Now add all the above ingredients with the pulp, in a pot and cook till the right consistency is attained. Blend to make it smooth when cold. i always wanted to know how to make it thanks for sharing. I have made tomato ketchup at home in a slight different way and it is preserved for more than one year. The first difference is that we did not use any water to boil the tomatos. We cut the tomato in pieces and put them into pressure cooker and put the cooker on gas stove. When it boiled in its own juice, we sieved it , the rest process was the same as yours. We did not keep it into refrigerator. After cooling, We added azinomotto and poured the ketchup in bottels and sealed them with wax. Also we made a very good use of pulp. We got it dried in the sunlight, then grinded the same . Now we are making use of the same as of other spices.